This day and age we are all so busy and alot of the time just don't have time for anything extra! I think that also includes our friends. 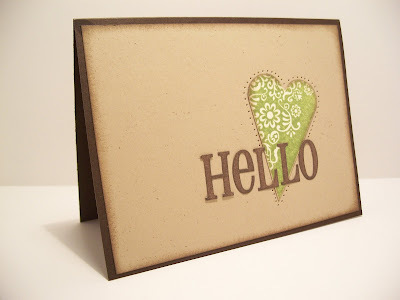 Today I am going to share a couple of cards that would be great to send to a friend just to say Hi! When we get something in the mail....the actual mail....not email, doesn't it just make you feel good? 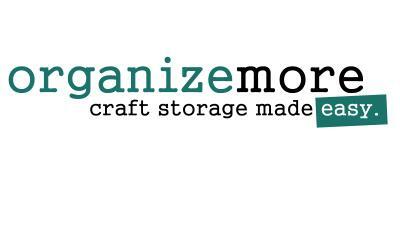 Especially something handmade! Sometimes these little notes are a pick-me-up, just letting you know you are note alone! Here are 2 super simple but fun cards that would be easy to share! 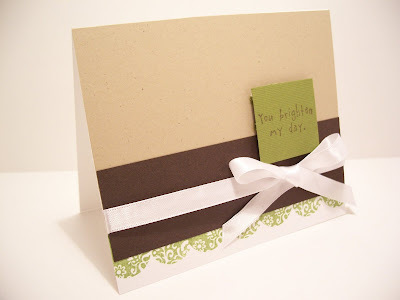 This card is super easy to make. 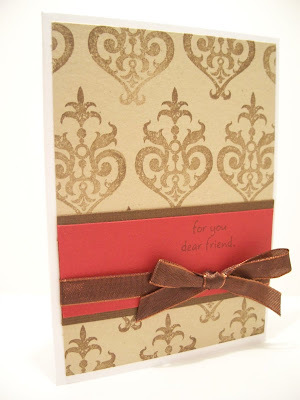 I layered the brown cardstock with Kraft CS. Stamped the image, cut it out, distressed the edges with Burnt Umber and attached it to the card. I used my paper piercing tool around the heart and added the sentiment! 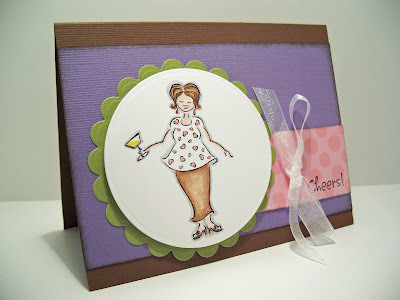 For this card I have some pictures below of how I stamped the scalloped border! So easy to layer with Kraft CS and then the Brown CS and a riboon! Here is picture of how I did it. I used TAC's Forever Family stamp set. Lining up the heart, I just stamped several time until I had an even border. Friends are a gift from God. We all need them! 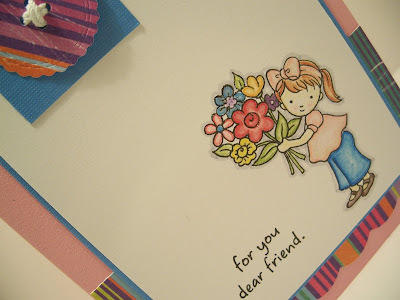 So make a card today and send it to a friend to let him or her know you are thinking of them! Here is a great article to read about being Too Busy for Girlfriends! This is an online magazine that I get by email! Great articles to read and good reminders for us all! 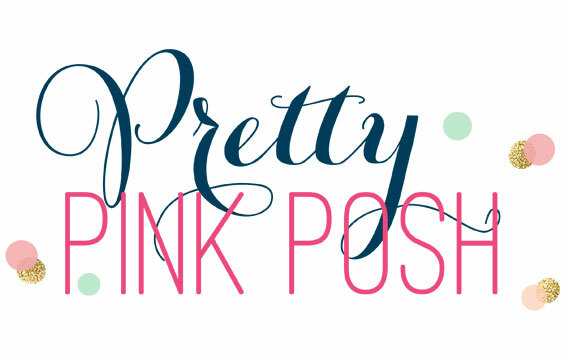 Once again, I am joining a blog hop! I love to do these because it gives everyone a chance to see how many things can be done with one stamp set! Take a look at several cards I have made with this set! Don't forget to click on the links at the end of the post to see some more great examples! This first card I love just because of the black and white! When I think "Cupcakes" I usually think colorful and birthdayish! This gives it a more elegant look, I think! I used the masking technique on this card! The swirls are actually a piece of a lollypop but I just wanted the "swirl" for the background! I traced the inside of each with a sparkle gel pen! This last card I made for a cupcake contest at the Winter Round Up! It was so much fun and there were SO many great samples made with this set! This set is really a fun one to color! 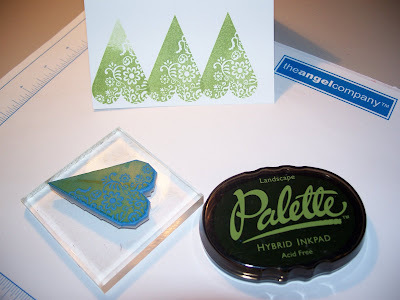 I am loving all the fun ways to color stamps! My favorite right now is Gamsol, a blending stump and regular colored pencils! I also use Watercolor pencils and a dove blender! It is amazing how many different looks you can get just by using different mediums! It may be hard to see in the picture, but each of the cupcakes are colored with a different medium. 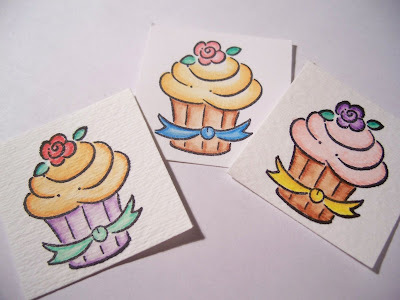 The first cupcake on the left is stamped on watercolor paper and colored with watercolor pencils and a water brush. 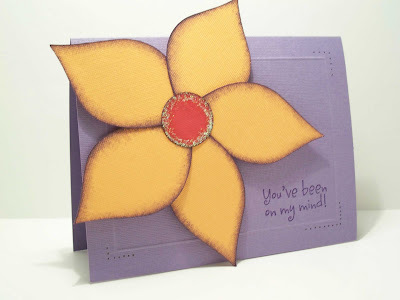 The middle is stamped on TAC Premium Cardstock and colored with Watercolor Pencils and a Dove Blender. 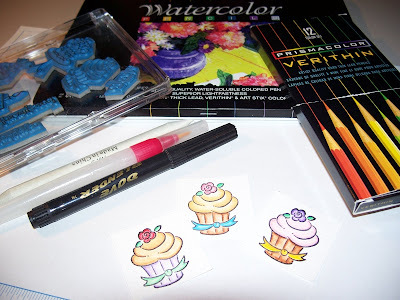 The cupcake on the right is stamped on watercolor paper and colored with crayons and a water brush. Such a great set to play with! 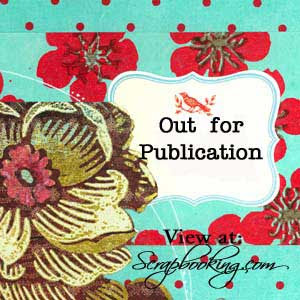 This last sample is by the sweet JoAnn Cisneros! She said I could post her swap as another piece of inspiration! I love this card! The Playful Parenthesis set from the magalogue is growing on me! :) How cute is this? Now check out all the other Angels and their creations! 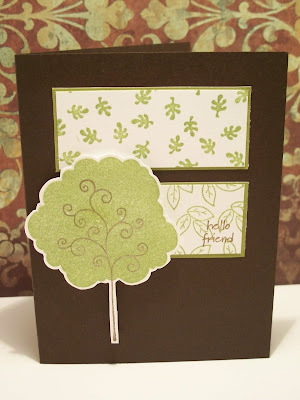 I made one card just for this challenge but I have also attached a few other "springy" cards! 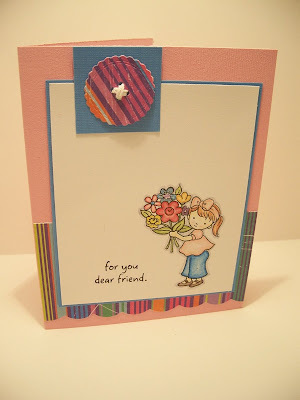 This first card uses the adorable March Stamp of the Month! I just love the set! I used Versamagic Key Lime (I think that's the name!) for the images! 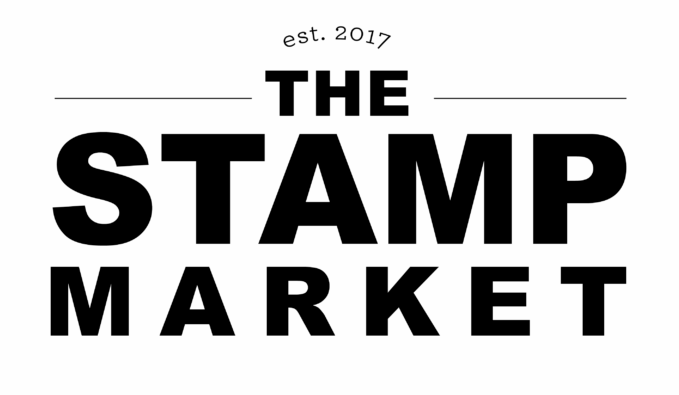 That is the best ink for the solid stamps! 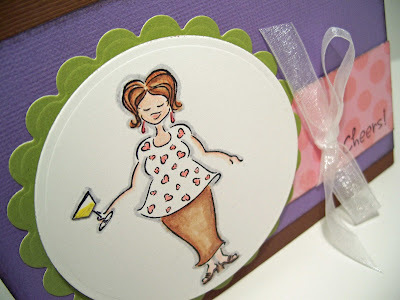 I also used TAC's Tag Tidbits for the "Think Spring" sentiment! 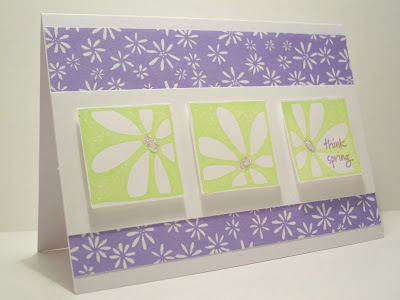 Here is another card using TAC's Springtime set! The swirls you see are actually from a tree stamp. I just used the top of the tree to make some flourishes on the egdes! It is amazing how you can really make a stamp set totally different than what it actually is just by looking at in a different way! This card is a little non traditional! 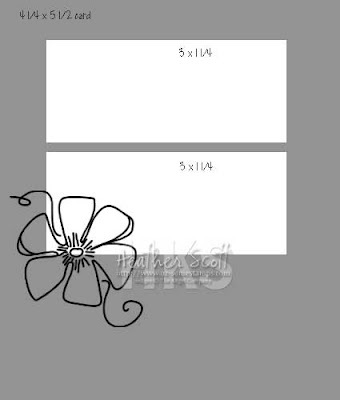 It obviously won't fit in an envelope but I just love the flower sticking off of the card! It would make a really cute place setting card too! I used my cricut for the flower and Ordinay Greetings for this simple card! 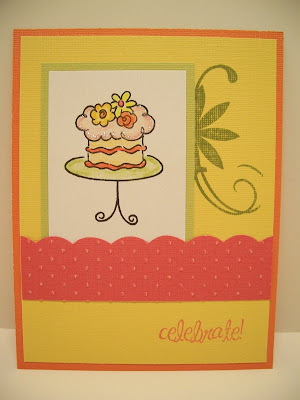 I hope you like my samples of "springy" cards! 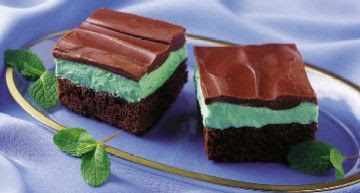 Here is a list of several talented girls who have also made some spring creations! For the last card, I made the flower with my Scor-Pal! 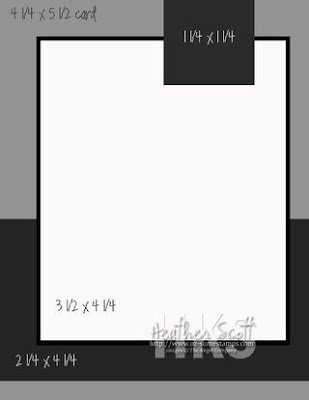 I scored a 1"x12" strip of paper every 1/4". I did this by scoring every half inch and then turning the paper over, shifting the paper to the 1/4" mark, and then scoring on every half inch again! Super super easy! And so cute, don't ya think? Both cards use TAC's Springtime set, which has to be a favorite right now! 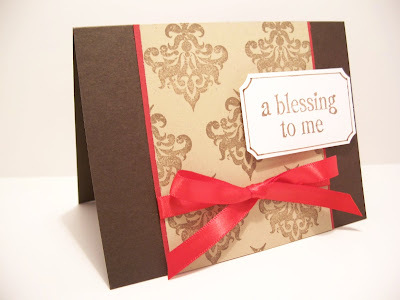 And of course my fav sentiment set, Ordinary Greetings and Tag Tidbits (for the first card)! ...and then we all made cards inspired by the picture! 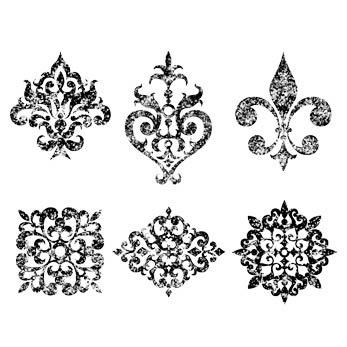 Right now I am all about making my own background paper....ever since the whole Damask thing! :) So, I found this cute little flower out of TAC's Flutter By set! I just love these colors and I am not sure I would have put them together on my own! Anyway, thanks for the challenge PW! And thanks for looking! Misc: Ribbon, Pop Dots, Sewing Machine! Damask....I've jumped on the bandwagon! I just received TAC's Aged Ornaments. I have to say when it first came out I didn't give it a second look. Just wasn't into it! NOW, I love it! It is a great stamp set for backgrounds! It is just so elegant! I love it! Oh, I think I already said that! Anyway, here are 2 cards I made with this set! Hope you like them! Thanks for looking! Today I am joining in on a Blog Hop from over at Paper Wings! We were asked to post a project using TAC's "Blissfully Ever After"! 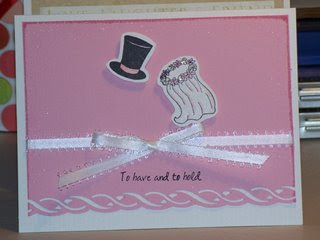 It is the cutest wedding set and I just love using it for cards! So, I have created 2 cards with the set and I am also including one from quite awhile ago! This was so super easy! 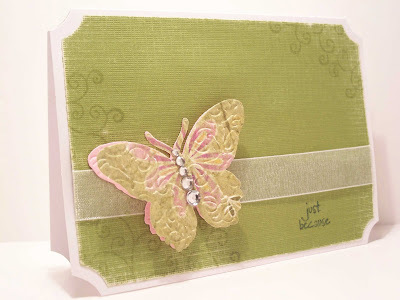 It is so simple to stamp a boarder across the card and then use the scor-pal to create a "border" for your border! ") It just gives it that nice clean edge and finished look! And again....so super easy! 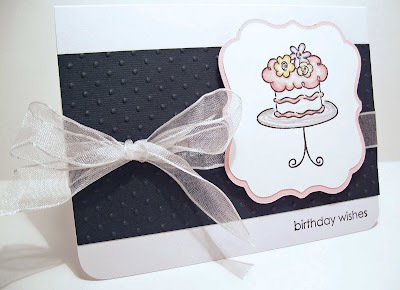 For this card I used Pink CS, White CS and Black CS. 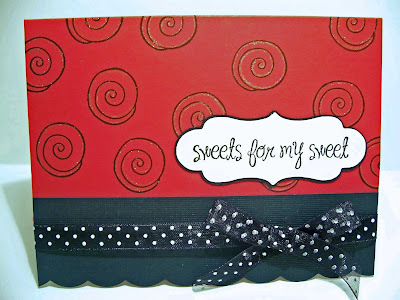 I used, of course, TAC's Blissfully Ever After and Curls & Swirls for the background. I stamped it in Versamark and then heat embossed with clear embossing powder! This was another easy one to make! 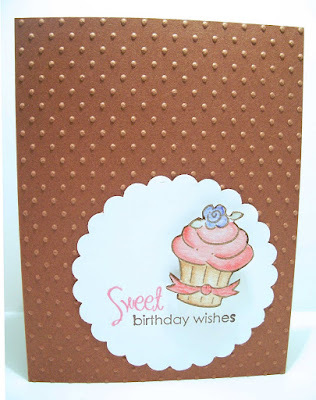 Those cuttlebug embossing folders are just too fun! 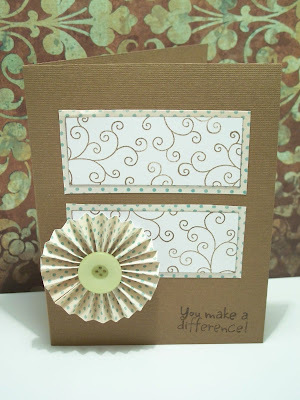 My scalloped and circle Marvy Punches made this focal point really stand out! I love my Marvy's!! I also used the exact same supplies for this card, as I did the last! And here is one I found on my blog from along time ago! I think was 2007! It is amazing to look back and see how my style has changed so much! Well, except for the ribbon! I still love bows!! Now take a look at what some other Angels created using the same stamp set! And here is my card....sorry about the bad photo! Anyway, here is what I finally came up with. This stamp set is an old Seminar set, so it is not available anymore. I do, however, LOVE her! She is me! I love that they had a girl with some curves! Isn't she cute? OH....by the way! 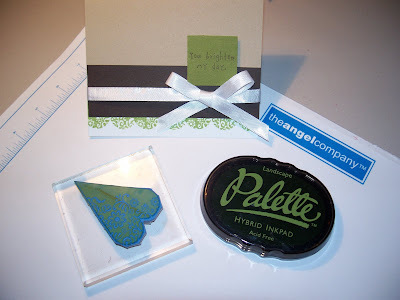 If you are looking for some inspiration using The Angel Company stamps, click HERE and you will find lots of samples using different sets!